207 Special Clear Hardener was especially developed for use with West System 105 resin in coating applications where an exceptionally clear moisture-resistant natural wood finish is desired. Improved formula chemistry allows for true clear cure with same UV stability without amber tint. An ultraviolet inhibiting additive improves the resistance of a West System 105/207 mixture to sunlight but the cured epoxy surface will still require the additional protection of a quality UV-filtering varnish. 207 is designed to self level for smooth finishes and to wet-out and bond fabrics. Although it provides good physical properties for general bonding applications, it is more difficult to thicken and less cost effective for this purpose than 205 or 206 hardeners. It's also used for laminating veneers where bleed through at joints may be exposed to sunlight. I am wanting to coat the bottom of my wooden driftboat. My question is will this product flex as 1) temp changes, 2) going through white water, & 3) when hitting the unavoidable rocks in river. This epoxy will have some flex properties to it, generally it should flex with the wood, and if it has been prepared properly before applying, you should not have any delimitation issues. If experience an impact of a rock, it will scratch or sometimes chip. This can always be fixed or restored after. There is a possibility that it can delaminate from the wood in that area from a good hard hit, but again it is depending on prior surface preparation and, as well as what the wood type you used. Hi JohnI have used this product with West System 105 on my canoe. I applied it 2 times on top of the fiberglass I used it is a very nice finish and looks very durable, andÂ for me the importance was to be able to see the wood grain. I haven't finished the canoe yet and have not been able to test it out under mentioned condition in question.Ample information can be found online. Not sure on the rocks, I'd guess it will at least stress it and possibly crack upon impact. It's fairly tough though. Temp changes shouldn't be a problem but direct sun for extended period of time will discolor it. White water would depend on how many rocks you hit... there are aluminum boats that are tough but not as pretty as wood. I don't know about flexing due to temp and water pressure but rocks willcompress the wood and create gaps that will allow water to enter. Anothercoat will seat the surface but not repair the dent. What is the ratio of 207 hardner to 105 resin . I am filling voids in walnut slabs. Hi Stan, the ratio is 3 parts resin to 1 part hardener by volume. Do not add extra hardener, it will only have negative consequences. The ratio is 1 to 3 by volume. It is 1 to 3.7 by weight. You can buy minipumps that will dispense at this volume ratio. Hi there, can anyone tell me if 207 would be a better hardner than 205 for inlaying turquoise into a maple table top? Or what the difference between the two might be? Thank you! The 207 is clear, the 205 can be slightly amber in color. I need to cover a bar top. Will the 105 and 207 products work for this application? Yes, if the bar is outside, it will need to receive some type of UV protection. Does West 207 clear hardener with 105 resin give off an amine blush on the surface?What is the re-coat time window before sanding is required? West System Epoxy can have an amine blush. Always best to wash with water after it cures. Recoat time is as soon as it gets tacky, cure in 9 - 12 hours and would require sanding. I have never used a container that small, so I don't know. I expect that if you are buying such a small container that you are also using very small amounts at a time. WEST Systems have a scale for use in this situation. WEST System 300 Mini Pump Set WSY-300Cap sizes on the pump set do not allow you to use the wrong pump on the wrong container. I am looking for an adhesive to bond a pea gravel patio, any suggestions? Never done that, but epoxy is certainly an option, depending on your application. You might want to also look at the adhesive matrix used in making Terrazzo flooring, which is basically a bunch of colored pebbles mushed together in a paste and then polished to a shine to make a smooth multicolored floor. That's all I got. 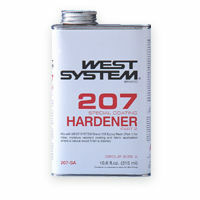 West System 207 clear hardener is used with West System epoxy resin to provide a clear resin for fiberglass. Although when mixed and supplemented with additives it can make an effective adhesive, it would, in my opinion, be inappropriate for use with pea gravel for a patio because 1). it would be cost prohibitive; 2). the finished patio would need numerous and repeated coats of a good (i.e. expensive) UV protective varnish otherwise the clear epoxy will turn opaque orange and deteriorate in weather; 3)unless working in small batches you'd have about 15 minutes to mix with pea gravel, pour in to patio frame and level before it set up, otherwise you have to pull up the whole mess and start again; 4). plus you couldn't work it in sunshine or other certain other weather conditions without problems. There are other products specifically designed for patios (and much less expensive) and you can find those out online or from a professional patio landscaper. this is not the product to use. I would recommend a trowel able polyurethane adhesive. Can this product be used for on rock walls? What is &quot;rock walls&quot;? sorry, don't understand your question ! I would think so. It stays clear and doesn't yellow. This works great on wood, not sure about rock. As it is a glue it is possible. You would need to ask the manufacturer. Do you mean for clearcoating the rock?If you want to do that, there are sealers made specifically to use on things like granite countertops that might be better.If you want to glue the rocks together, then you should probably find a specialty product. Paver adhesive might work. Sorry to say that I don't have an answer to your question other than to say that I would suggest contacting the West System folks directly. I put gelcoat over west system all the time. Make sure west systems is totally dry then sand. Make sure gelcoat has wax or covered with pva or duretic is added. How long does 207 hardner take to cure? In inside room tempeture. It's been several years since I used it on my canoe but as I remember about 24 hrs to touch - I think directions say about 30 days to fully cured. Not exactly sure. I tend to work on boats in the evening, so it is almost 24 hours between applications. Always seems to have hardened within 24 hours. It takes longer than 205; my policy with epoxy, any kind, is to let cure overnight, the longer the better ! Curing times for epoxy vary depending on material temperature, room temperature, humidity and additives no matter what hardener you are using. 205 is quicker then 206 and 209. But then again the actual curing time is dependent on several variables. The warmer the better.Quoting from the Gougeon Brothers book on boat construction page 33, &quot;Coatings of West Systems epoxy should be sufficiently cured for subsequent operations after 12 to 24 hours-usually overnight.&quot;The West System User Manual page 3 describes methods of controlling cure times. I have found these recommendations to be very helpful.You can access this via the internet site for West Systemif you didn't receive one with your epoxy resin.My experience with 207 hardener has been curing times of 4 to 6 hours indoors with the materials all being room temperature above 70F to overnight outdoors with the temps being in the 45F to 50F ranges.I suggest a trial batch to see what you get.Hope this helps and best of luck. I have used many other epoxy systems and have issues with amine blush and washing it off. I really like not worrying about it with this product. An excellent hard clear finish. Best carbon clear finish is Best Varnish!! Predictable cure rate and super looks on my cedar strip canoe. Awesome product, but I did not necessarily like how it was packaged. JD placed a strip of packing tape over the cap which extended onto the sides, to keep the integrity of the cap I suppose so there was no chance of spillage, awesome idea. BUT, when I tried to remove the tape from the can, it removed the portion of the can that contained the safety information, basically ripped the manufacturer's label off in the process. The tape is see through enough so I did not try to remove and more but possibly next time use crystal clear tape. Use this hardener when you will be clear coating and UV is a concern. This is an awesome product. I have yet to discover what can be done with it. Adding fillers and coloring agents, repairs to center boards, hulls and other plastic, fibreglass parts become an easy project. Due to wood out gassing, my current restoration ( Mahogany) project has been quite difficult. Attempts for help have been frustrating. Overall I am very happy with this product. Thanks for a chance to respond, the 207 hardener wasn't able to open. The screw on lid was adhered to the "flange" and that was spinning around, there had been some leakage during shipping. I was unable to open the lid correctly, not sure if it was West Systems or Jamestown's doing but it made application harder. Finally just had to punch two holes in it and pour it out that way, wish I could of used my pumps though...It seemed I lost about a quarter of the can during transit. Other than that, you're all great. Talk soon. I like this product for exterior use under a varnish. In my own tests it at least doubles the life of the varnish.Be aware that West is changing 207 from "Special Coating Hardener" to "Special Clear Hardener" under the same part number. The new product drops the Amber tint. Normally this isn't a big deal but if you are caught in the middle of a project and switch there can be a noticeable difference. It would be nice if West would have a tint additive if you wanted to continue using the Amber product (which is discontinued in production) much the same as Crystalac does with its warm dye toner, which changes the clear to traditional varnish tone.